Request a quote for a bulk order for H3T45p polyclonal antibody - Pioneer. Please fill out the form here below. Your local sales account manager will get in touch with you shortly and send you a quotation based on your requirements. Polyclonal antibody raised in rabbit against the region of histone H3 containing the phosphorylated threonine 45 (H3T45p), using a KLH-conjugated synthetic peptide. To determine the titer of the antibody, an ELISA was performed using a serial dilution of the Diagenode antibody directed against H3T45p (cat. No. 15410321) in antigen coated wells. The antigen used was a peptide containing the histone modification of interest. By plotting the absorbance against the antibody dilution (Figure 1), the titer of the antibody was estimated to be 1:350,000. To test the cross reactivity of the Diagenode antibody against H3T45p (cat. No. 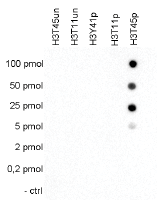 15410321), a Dot Blot analysis was performed with peptides containing other histone modifications and the unmodified H3T45. One hundred to 0.2 pmol of the respective peptides were spotted on a membrane. The antibody was used at a dilution of 1:20,000. Figure 2 shows a high specificity of the antibody for the modification of interest. 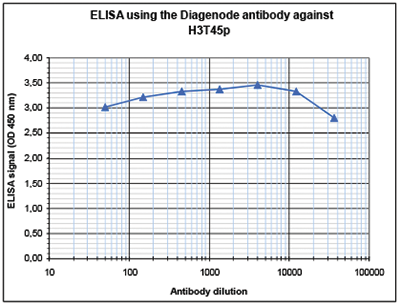 Diagenode strongly recommends using this:	H3T45p polyclonal antibody - Pioneer (Diagenode Cat# C15410321 Lot# A2280P). Click here to copy to clipboard.